Math should not be boring, so make ACT prep fun and productive. This is a unique kind of practice for ACT and SAT preparation. There are 45 questions and 45 full-length explanations to answers which may be used as a student self-assessment. 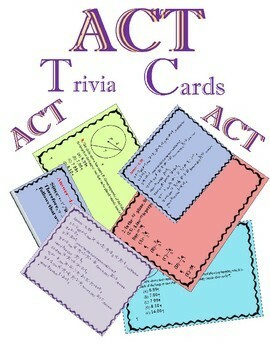 Color-coded trivia cards with Algebra 1 & 2, and Geometry (all-inclusive) math questions are the way to go! 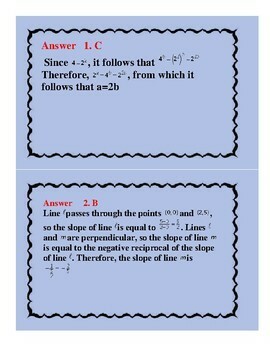 You can print these as 2-sided (directions included) or keep the answers separately. There is also a black and white version included. As a bonus for those who want to save on ink, the zip file includes a black and white version with different questions. This is the most useful product you can buy at the price. Why make your students study time boring when this product will be a fun and productive addition to your instruction. 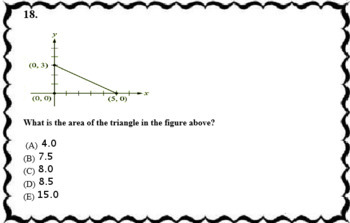 Answers include full explanation and/or procedure for calculations. This product is similar to the SAT Trivia Cards and Algebra-Geometry Flash Cards so please do not purchase both products. You’ll find tons of math and English ACT and SAT prep products in My Store.